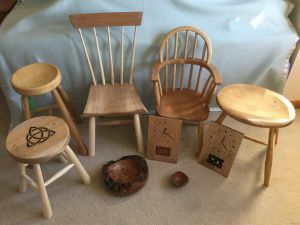 Stuart creates traditional handmade chairs, stools and small furniture and household items using locally sourced hardwoods such as elm,ash, oak, cherry and sycamore. Furniture items can be commissioned, each piece being unique. Donna uses fine quality yarns to create her hand knitted Black Tulip range. This consists of chunky wraps and cowls, stylish shawls,delicate lacy scarves and accessories, many finished with beads and embroidery. 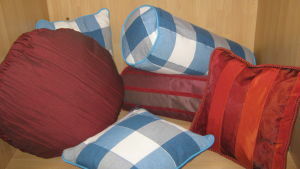 Donna also produces a selection of felted bags and one off cushions in mixed yarns to suit any decor. 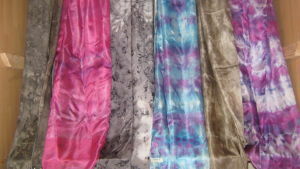 Tessa has been practising as a textile artist and teaching over many years. 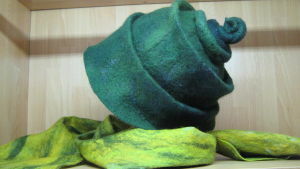 Her work is mainly in felt and is frequently embellished with embroidery and beading, each piece is completely individual, her felted work includes bags, hats, jewellery, vessels, pictures and hangings. She also makes garments in very fine 'Nuno' felt. In researching design sources for her work Tessa has developed an interest in photography and also produces mounted prints of some of her images as well as cards. Displayed in Hand Pict are selection of Geoff Riley original oil paintings together with pen&ink framed drawings of Letham. 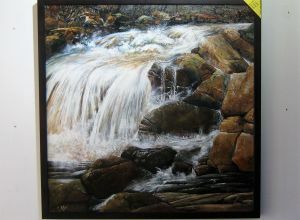 There is also a wide selection of fine art prints, both framed and mounted only ready for you to frame. 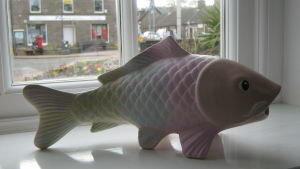 Geoff also produces hand thrown stoneware pottery, a selection of these are always available. 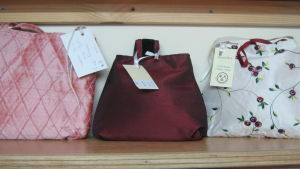 Linda makes all types of bags from large shoppers to dainty evening purses in beautiful and eye catching fabrics. 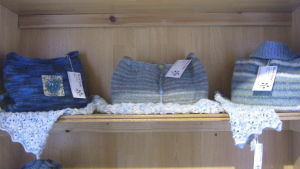 She also produces a range of hand knitted scarves in alpaca and wool. A love of nature, landscapes and especially the sea have heavily influenced Lynda's painting and textile pictures and wall hangings. An interest in eco dyeing with natural ingredients produces the soft toned palettes in her silk scarves and nuno felted hand embroidered scarflettes. Margaret ceramics range from her ever popular green men and wall hanging ghekos to tea light holders and children's ornaments. Christmas trees and other seasonal items are a speciality. 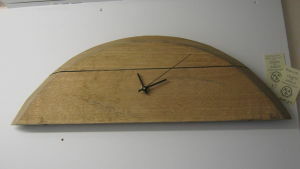 Peter uses mainly locally sourced woods to hand turn his sought after chopping boards, bowls and clocks. He also produces larger items for the home ranging from coffee tables and large mirrors to table lamps and wine racks. As its name suggests, Riddell's Ragbag produces an eclectic range of handmade unique and imaginative goods ranging from, but not limited to, wooden spoons [coming very soon] and crocheted cotton coasters to bespoke greetings cards and hand-knitted baby socks. From pieces of beautiful stained glass to large driftwood mirrors and barrel stave clocks, Steve's work is quite unique and often dictated and inspired by the materials he sources. Andrew offers Beautiful Pens of various types, as well as Pens made from Exotic woods, he specialises in Hand Cast Coloured Resins. 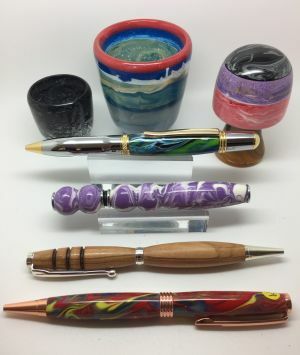 Timbertop Pens produces various Pen and Pencils, Perfume Dabbers, Letter Openers, Rainbow Mushrooms, and Resin curios. 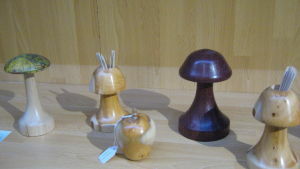 He also offers for sale Pen and Bottle Stopper Blanks for the discerning Wood Turner. Weemack Creations produces a variety of hand painted suncatchers (window clings) to brighten up any window or mirror. 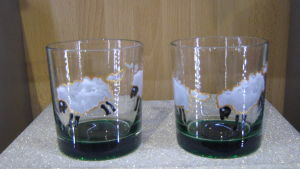 They also have a selection of Hand Painted glassware including wine glasses, vases, shot glasses and baubles. All items can be personalised. To compliment their hand painted votive holders Weemack Productions also make a selection of scented candles and wax melts. Hand knitted items in quality yarns. 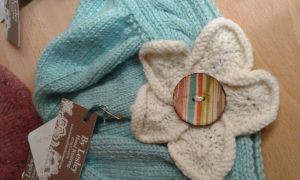 A speciality is the upcycling of quality childrens outfits with the addition of hand knitted tops, jumpers, jackets and cardigans making each outfit unique. 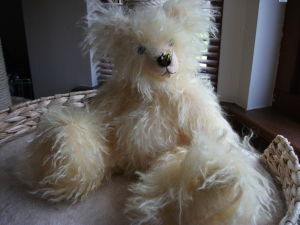 Diane creates One of a Kind Hand-stitched Teddy bears and Furry Kritters from Schulte mohair, Alpaca and Faux Fur. She is a self taught teddy bear artist and has been making bears for 15 years. Personalising with charms and in some cases musical movements.